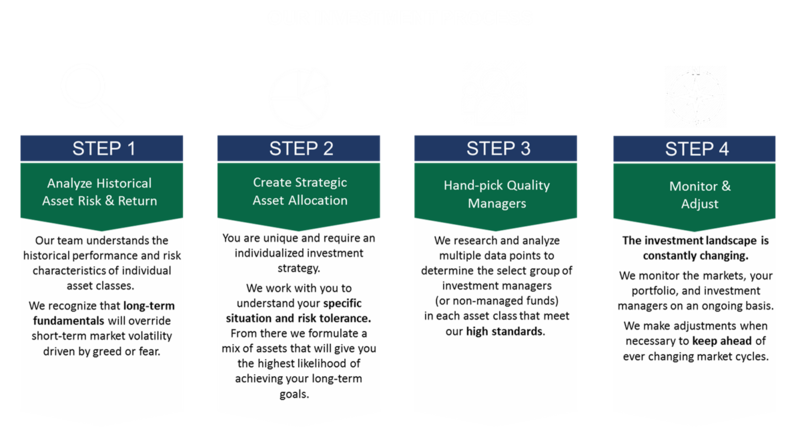 Our investment process focuses on long-term results. Our experienced Investment Committee uses fundamental research to review target asset allocations and identifies experienced investment managers who share our focus on results. We believe in the power of diversification to improve returns. We use a wide variety of mutual funds and exchange traded funds (over multiple asset classes) in our portfolios. We are not market timers. We do not pick stocks or attempt to forecast future market behavior, and we do not invest on the basis of the latest tip or the assumption that we can out-guess the market. Note: All investing involves risk, including the possible loss of principal. There is no assurance that any investment strategy will be successful.